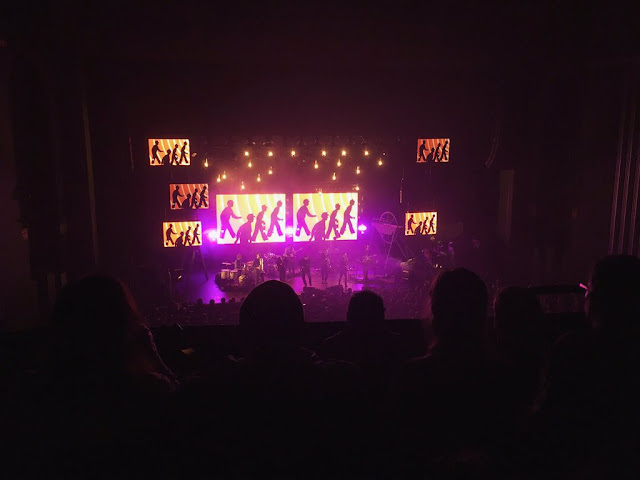 On Thursday night I headed to Hammersmith Apollo for the closing night of the Public Service Broadcasting UK tour, promoting their latest record Every Valley. Based on a short set I saw them play for the Music Venues Trust last year at the Roundhouse, their Live In Brixton album and my extensive listening of all three studio records I had pretty high expectations and they certainly delivered. 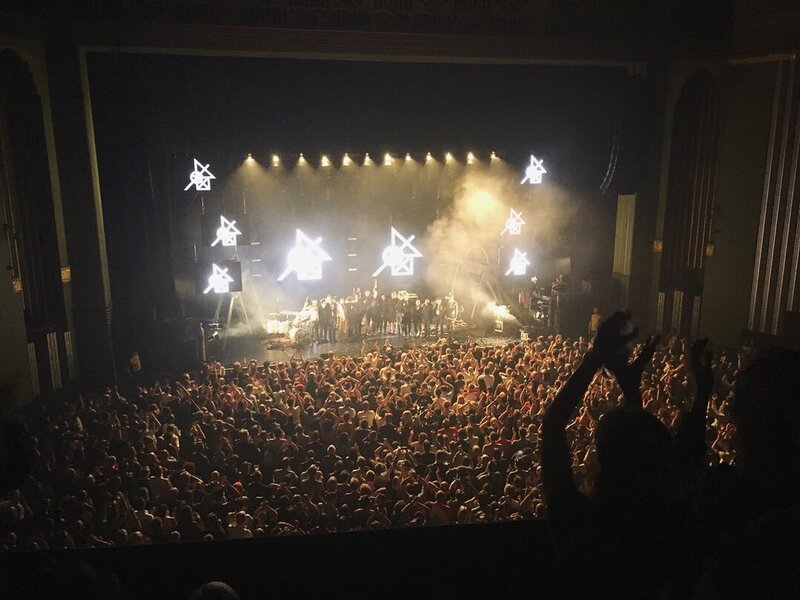 Alongside The Maccabees at Alexandra Palace in June, the Stornoway farewell shows in March, The Hoosiers anniversary gigs this month and Bear's Den at the Apollo back in April the gig has certainly made it's mark as one of my favourites of the year! After a delay getting into the venue I missed some of the opening set from Londoners Palace who released their debut album So Long Forever last year (listen here) but I enjoyed what I did manage to catch! It may be because I was seated and not thrown into the set as I would normally be from the front of the crowd, but it felt fairly relaxed and not quite as full on as support sets can so easily become, and I was able to actually listen to the lyrics and they proved a lovely warm-up for what was to come! After a quick turn around the Public Service Broadcasting chaps took to the stage (but not before a friendly reminder to only use mobile phones with respect to those around you - which could certainly do with being said at most gigs!) Opening up with the first two tracks of the latest record I was instantly bowled over and reminded why I love the band so much. If you're new to them, their bio reads that "J. Willgoose, Esq. and Wrigglesworth sample old public information films and archive material and set them to new music. Live, the films are screened simultaneously as laptops are fiddled with, drums are pounded, theremins are wafted at, guitars are bashed and banjos furiously plucked. Teaching the lessons of the past through the music of the future." In the absence of vocals on the most part, the focus is on the musical capabilities of the band much more than in the majority of concerts, and each member of the band proved to be a total genius - each taking on multiple instruments and contributing to a truly impressive sound. They were helped along for most tracks by their brass ensemble The Brassy Gents who brought yet more cheer to the evening while helping to make it sound even better too. With their latest record being the first to feature collaborations with vocalists, they also called on various artists to help on particular tracks. Instrumental trio Haiku Salut joined them for They Gave Me A Lamp and delivered some beautiful harmonies, and in a particularly noteworthy moment of the show, Lisa Jên Brown joined them to perform You + Me, a track which she duets on with PSB's J. Willgoose Esq. Despite his anxieties about playing a quieter track to kick off the encore, the crowd were entirely behind him as he delivered both a beautifully delicate (and rare) vocal and a more beautiful still guitar solo. As if all of that weren't enough, after promising two more tracks, thanking the various members of the band and performing first album hit Everest (confetti cannons included) the band welcomed the Beaufort Male Choir to the stage to perform Take Me Home, the closing track of Every Valley. With the various members of PSB jumping off stage to watch from the barrier it was a really emotional and fitting moment to close the final night of the UK tour, and the choir got one of the biggest cheers I've probably ever heard at a concert of that size. Absolutely crazy and beautiful scenes which were thankfully captured by a member of the crowd here! To summarise - long may Public Service Broadcasting reign. Since being introduced to their first album by a friend back in 2014 I've been fairly besotted with their tunes and they certainly do not disappoint in the live environment. Reflecting on the show to write this review I've become instantly desperate to see the band again so I hope that it's not long before they're back touring the UK! I've also realised a new life goal of being pals with the band and getting to witness some of what goes into making their records as my admiration and fascination towards them has increased massively! Nottingham singer-songwriter Saint Raymond has released new tune Nightcrawling from upcoming EP A Light That Blinds, his first release since debut album Young Blood in 2015. Aiming "for something that was a bit heavier than what I usually do", Saint Raymond has managed to slot the tune nicely into the realm of indie pop, creating quite the earworm with creeping basslines driving the track. The new EP is due for release on November 17th through Never Fade Records and with his debut album reaching the UK top 10 upon its release, and Saint Raymond joining the likes of Ed Sheeran, HAIM and Jake Bugg on major tours across the UK in the past, it's certainly one to watch out for! Follow Saint Raymond online - Facebook | Twitter | Instagram. Discovering an artist that you haven't listened to before whose music you instantly fall in love with is always a magical experience... having released an EP a few years back Cosmo Sheldrake is far from a new artist but I was introduced to his music as the support act for Johnny Flynn and the Sussex Wit last week at London's Roundhouse. Performing a set with only his keyboard and all kinds of samplers for company, Cosmo was instantly impressive and really endearing, introducing the audience to the sounds he was sampling - lots of mysterious and intriguing things including sheep, pigs, fish, slate and even the Sun! Much to my delight, Cosmo told us that he's just finished work on his debut album, which he'll be releasing through Transgressive Records (a dream of a label who work with the likes of Foals, Alvvays and Johnny Flynn himself) around April next year. Come Along is the first tune to drop from the album and Cosmo's first release for three years, so quite the event... on the track you can hear him playing over 10 instruments including household items like a vacuum cleaner and empty beer bottles. The track is co-produced and mixed by Matthew Herbert and, Cosmo describes, it "began when I decided to make the most preposterously over-the-top introduction that I could [...] I made this ridiculously grandiose beginning, and then it developed from there." Follow Cosmo Sheldrake online - Facebook | Twitter. Friday was a very very good day for new tunes, especially because one of my favourite bands We Were Evergreen (who are now, if a little confusingly, just going by the name Evergreen) are BACK! New tune Aux Echos is their first in quite a while, following up the brilliant 2014 debut album Towards. While I won't pretend to understand the lyrics as they're in the band's beautiful native French I am absolutely digging the tune, which is giving me some pretty strong Arcade Fire vibes - never a bad thing! With past tracks like Daughters, Leeway and False Start the band set quite a high standard of music video and this totally meets that, matching the quality of the tune! Get watching and listening, and keep your eyes on the band's socials for news on more new tunes and their second album! The band head on a short run of shows to promote the release of the EP this December, taking in London's Shacklewell Arms on 6th, before Southampton on 7th and Manchester on 8th (with more shows still to be announced!) Grab tickets for all of those here. Since being introduced to his tunes a couple of years ago by a friend who recommended that we check his set out at Bushstock Festival, I've harboured a love for Ady Suleiman. His beautiful voice drew me in to tunes like So Lost and State Of Mind and new release Not Giving Up, which premiered online a couple of weeks ago, didn't disappoint. You can listen to a live performance of that track here, but for now, here's a stunning new session of What's The Score filmed in a French vineyard with Mahogany Sessions. Ady Suleiman plays a tiny run of UK shows in November, taking in Rock City in his hometown Nottingham, The Lantern in Bristol and London's Jazz Cafe - London sold out very quickly and tickets for Nottingham and Bristol are running low, grab the last few here. With him constantly being championed by Communion Music I'd never doubt that Joseph J. Jones is anything short of wonderful and he's certainly proven himself true to that accolade through new single Crawl which was released last week. I was luck to catch him perform a support slot for Jack Savoretti at Royal Festival Hall on Southbank back in March and at a Communion showcase gig in May and the track quickly became a live favourite of mine and I'm chuffed that it's been released into the world! Take a listen below and if you like what you're hearing, check out more of JJJ's tunes, including previous single Gospel Truth, over on his Soundcloud. Dare I say it..... he's certainly one to watch! Follow Joseph J. Jones online - Facebook | Twitter | Instagram. I was introduced to Japanese indie-rockers The fin. when they played our Tigmus stage at The Alternative Escape back in May. Despite some technical issues and delays meaning their set was cut short, the guys delivered a really enjoyable set and I was intrigued to see a new tune from them in my inbox! Re-releasing a track that was on a previous EP, the band describe the new version as "repetitive [with] a big world and reality in it", describing the track as being "about energy which is around everywhere or inside you, and states that it conflicts each other in many ways." Its synths and the dreamy atmosphere the band create are sure to impress fans of the likes of Friendly Fires and Metronomy, and if you like what you're hearing, the chaps are on tour in the UK this week supporting KOYO, before a support slot with Clay on 29th October at Camden Assembly. Follow The fin. online - Facebook | Twitter | Instagram. Rewind ten years and you'll find The Hoosiers gearing up to release their debut album The Trick To Life, which quickly became a cult classic, reaching number one in the album chart and propelling them into the spotlight. If you can't recall the band by their name, you'll almost certainly know the hits Goodbye Mr A, Worried About Ray and Cops and Robbers (and most likely remember all of the lyrics!) Return to the current day and a lot has changed for the band, with the departure from their major label a few years back, line-up changes, and three further records under their belt (listen to them all on Spotify.) Ten years on from the first record in 2007, they've just kicked off a tour to celebrate it's anniversary, and I was lucky to head to the first night of the tour last Friday at The Bodega in Nottingham! Having been a huge fan since the first album was released, I first saw the band live in May 2011 when they toured to promote their second album. I'd been to a couple of open air concerts in my hometown before but this was the first gig that I begged my parents to take me to so it was a pretty big deal! Since then the band have been super important in my life... looking back I honestly believe that getting to see them play and meeting them back then had a huge impact on how much I love music, which means an awful lot as its the industry I work in and have so much passion for now (and that love is what kicked off the blog!) I've made lifelong friends through the band, been to lots more shows (Friday's was the fifteenth) and made some beautiful memories at those, not to mention writing my final year dissertation in part about the band and interviewing them and some of their fans for it. Friday's gig was kicked off by local artist Joseph Knight playing some sad acoustic tunes (who doesn't love sad songs?!) - check out his tune Minutes. After a quick turnaround, the stage was ready for The Hoosiers, but first they gave us an unusual warm-up, inviting two fans up to the stage to do a spot of karaoke. It's a first for me but I found myself thinking at the time that every gig should start that way, as the tunes (Here It Goes Again and Naive) lightened up the crowd and got everybody singing along. The Hoosiers soon took to the stage, performing a set of two halves, first performing The Trick To Life in full. TTTL is such a poignant album from my youth and is really special to me so getting to hear it played live among a sold out crowd of people who clearly loved the record just as much and sang along to all the words was an incredible experience. Despite Worried About Ray and Goodbye Mr A coming early in the set (a little disorienting as they've finished with GMA at possibly every show I've seen them play) the band and audience maintained as much energy for the rest of the tracks from the album. It blew my mind just how well the rest of the crowd knew the lyrics to each song from the album, including the quiter, slower numbers like Clinging On For Life which I recorded and you can watch below and my personal favourite Everything Goes Dark. The first half of the set was topped off with Irwin inviting a fan onstage to sing the album's last track Money To Be Made with him - I almost wish I'd been brave at the time as I know the track inside out and reckon it'd be pretty unforgettable, but the chap who put himself forward did a great job and wasn't actually a bad singer! After a quick departure from the stage the band returned to play the second half of the set, kicking off with a tune from their latest record, Pristine, followed up by first album B-side Rules, which I can't say I ever expected to hear live! Somewhere In The Distance and Up To No Good, which feature mini Teardrops and I Can't Feel My Face covers followed and went down really well with the crowd, carrying on the big singalongs, before they finished up with second album single Choices. Despite being the first show of the tour the show was just as awesome as the first time I saw them live, and I especially need to give a shoutout to Paul Frith and Leighton Allen who have joined the band recently for live shows on keys and bass respectively - both doing a cracking job!! The night was topped off by bumping into Irwin and Paul outside the venue afterwards, it's always lovely to catch up, especially as it was my Mum's first time seeing the band since Summer 2015 - cue a reunion selfie! If you made it this far in the post and want to relive a slice of 2007 for yourself, check out the rest of the tour dates, including a show at London's famous Scala next Friday (13th Oct) on the band's website here, but be quick as many of the shows are selling out! If like me you're a fan of modern folk from the likes of Matthew & The Atlas, Ben Howard and Fleet Foxes, I reckon you'll enjoy this new (ish) tune from Brighton's Josh McGovern. Premiering the video for The Devil Below Me at the end of August, The Independent called Josh "an accomplished, intriguing new talent" and they're certainly not wrong there. The track is my first introduction to Josh and I've gone on to check out a live video of his tune Brother, equally intriguing and just as brilliant a tune! About the new track, Josh says that "I really wanted to make a video that would complement the story of the song. I guess it’s all about burying your past problems. The video was filmed and edited by my good friend and filmmaker Sam Shaw. It took five separate shoots to film because we were battling the English weather but it ended up being something that I’m really proud of.” With a depth of tone reminiscent of the likes of George Ezra and Joseph J Jones, the track is a beautiful combination of folk and daydreaming Americana, with sweeping harmonies that have cemented themselves into the front of my mind after a few repeated listens - I'll certainly be looking out for more from this young artist! Follow Josh McGovern online - Facebook | Twitter | Instagram.